High Velocity Fan 9" , 180 degree, vertical adjustable fan head, With four rubber foot pads, 3 aluminum blades, 6 feet, 2 prong plug, black, powder-coated. Rotary dial control, Compact space saving design, 90 deg oscillation120V- 60Hz 0.45A, ETL & cETL. 2-speed energy savings/whisper quiet operation motor. Side speed controls. Built-in adjustable slide screens with lock. Fully assembled, no tools required for installation. Safety grill guard. ETL/CETL. Provides fast-moving air flow for larger work areas such as garages, workshops, etc. Heavy-duty metal construction. Three-prong grounded. ETL listed. Top-mount, high performance, 5-wing blade, multi-position base. 180 degree adjustable airflow, durable plastic construction, integrated carrying handle, removable front grille, designed for high air velocity. Made in USA. Reversible window fan. Model: BP2-9A, 9 in Blade, 3 Speeds, Adjustable width from 23-1/2" to 35" White, High performance quiet operation motor. Digital thermostat control. Automatic conversion from intake to exhaust. Two prong. ETL & cETL Listed. Compact design, superior performance moves air up to 65 ft. Fully adjustable airflow, adjust to high, medium and low. Energy saving, circulates the air from heating and cooling systems. Removable grill 7.25" diameter. 1.1 amps, 62 watts, 1000, 1500, 2000 RPMs. Dimensions: 9.75" L x 9.25" W x 12.75" H.
Compact design, superior performance moves air up to 65 ft. Fully adjustable airflow, adjust to high, medium and low. Energy saving, circulates the air from heating and cooling systems. Removable grill 7.25" diameter. 1.1 amps, 62 watts, 1000, 1500, 2000 RPMs. Dimensions: 9.75" L x 9.25" W x 12.75" H. Provides fast-moving air flow for larger work areas such as garages, workshops, etc. Heavy-duty metal construction. Three-prong grounded. ETL listed. 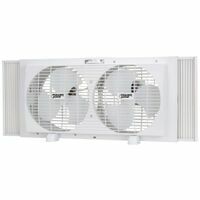 Provides fast-moving air flow for larger work areas such as garages, workshops, etc. Heavy-duty metal construction. Three-prong grounded. ETL listed. High velocity floor fan, three-speed energy-efficient PSC motor. Fan head tilts for versatile use, individually balanced fan blades, durable powder-coated finish (RoHS compliant). Permanently attached adjustment handles. Power cord has built-in retainer. OSHA compliant grille. UL listed, 1-year limited warranty. Independent motor control for air intake, exhaust, or exchange. Adjustable thermostat for automatic comfort control. Two, whisper quiet speeds. E-Z-Click expander panels for a safe, custom fit. Fits windows 25" to 35"W and 12"H and larger. Fully assembled for window use. Snap-on feet included for table or floor use. ETL Listed. Base provides added stability when operating from the floor or desktop. Air Circulator uses signature vortex action to move air up to 70 feet, fully circulating all the air in the room. Ideal for small to mid-size rooms, such as a bedroom, kitchen or office. Operates at a whisper quiet level. Patented removable grill makes cleaning easy and convenient. Plugs into any household outlet, no batteries needed. Dimensions: 12.00" L x 8.80" W x 13.60" H.
Powerful for high-volume air movement. Fan head pivots vertically and locks in place. Durable, impact-resistant plastic construction. Fully assembled, lightweight, with carrying handle for easy transport. Energy-efficient 25-3/8"L x 7-3/16"W x 23-3/8"H. ETL Listed. All metal construction, 360 degree vertically tilting head, 3 prong grounded plug, AC120V 140W, 3-speed wind High velocity floor fan or can be mounted on the wall. Features include durable, tubular steel construction, rubber scuff pads to protect floor surfaces, and front mounted controls. Comes with a one piece QuickMount wall bracket for conversion to a wall unit. Bracket is designed for 16" wall studs. Safety features include a 6' grounded cord. Includes comfortable carrying handle. ETL Listed. Rotary dial controls. 20" high-velocity pedestal drum fan. 3 speed settings. All metal construction. Adjustable tilt fan head. Size: 25-1/4" L x 6-3/4" W x 50-59" H. ETL/cETL listed. Electrically reversible window fan powerfully circulates air through two to three rooms. Turn of the dial reverses motor. Three paddle blades. Fits windows 26.5" to 34.5" wide and 22" high and larger. ETL Listed. 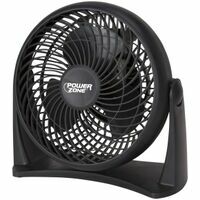 2-Speed tilt fan provides dependable, lasting performance. For industrial, commercial and residential use. Use to keep people and machines cool on the factory floor or in the warehouse. Dries out water damaged areas or speeds the curing process of tile or drywall. Cools the home or workshop, circulating fresh air in damp basements, even blowing away insects while barbecuing on the patio. 3.6 Amps direct drive, 2,800 to 4,000 CFM, 22-gauge steel housing for durability, non-skid and positioning legs. Tilts airflow a full 180 degrees. Engineered for vibration-free operation. 7.5 foot power cord included. UL listed. 26'' diameter, 12'' barrel housing width. Heavy-duty, industrial 2-speed fan. PSC thermally protected motor. Powder-coated rugged 22 gauge prime steel housing for durability. Powder-coated OSHA approved, rust-resistant grilles. Stable non-skid legs. Engineered for vibration-free operation. C/UL/US listed. Includes 7.5 foot power cord. 12'' barrel housing width. 800 RPM. Heavy duty thermally protected motor. Powerful airflow: 4100 (low), 4400 (medium), to 4800 (high) CFM. Fan head tilts 90 degrees. Adjustable fan height from 62? to 66.5?. All metal construction. UL listed. 9 foot power cord. OSHA compliant powder-coated grille. Easy to assemble with household tools. Heavy-duty, industrial 2-speed fan. PSC thermally protected motor. Powder-coated rugged 22 gauge prime steel housing for durability. Powder-coated OSHA approved, rust-resistant grilles. Stable non-skid legs. Engineered for vibration-free operation. C/UL/US listed. Includes 7.5 foot power cord. 12'' barrel housing width. 800 RPM. Powerful, heavy-duty 2-speed, PSC thermally protected motor. Belt drive design for ultra-quiet operation. High velocity airflow. Dual ball bearing with reinforced steel motor mounts. OSHA approved powder-coated, rust resistant grilles. Sturdy, non-skid supports. 22 gauge prime steel housing with durable powder-coated finish. Includes 7.5 foot power cord. C/UL/US listed. 16.5'' barrel housing width. 450 RPM. Powerful, heavy-duty 2-speed, PSC thermally protected motor. Belt drive design for ultra-quiet operation. High velocity airflow. Dual ball bearing with reinforced steel motor mounts. OSHA approved powder-coated, rust resistant grilles. Sturdy, non-skid supports. 22 gauge prime steel housing with durable powder-coated finish. Includes 7.5 foot power cord. C/UL/US listed. 16.5'' barrel housing width. 450 RPM.